It was a great pleasure to meet the Health Secretary on his recent visit to Leeds after launching his new “tech vision” for the health service. 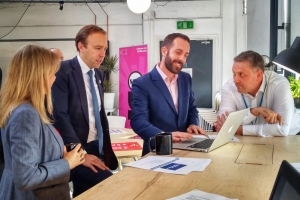 I met Matt Hancock MP at the ODI in the centre of Leeds on Friday 19 October 2018 and talked him through our development for Helm – an open platform solution for a person held record. I was able to share with him the UI/UX experience of Helm as it looks right now and was pleased to hear very positive responses both from the Health Secretary and his Chief Technology Advisor, Hadley Beeman. Helm has been in development for a number of months to ensure that we’ve got strong foundations for people accessing and contributing to their own health and wellbeing information. It has involved passionate work from a number of highly experienced technical people as well as clinically direction from Dr Tony Shannon, along with strong creative development from Simon Gamester. Helm benefits from a number of innovative technologies supported by Ripple Foundation, namely, PulseTile, QEWD.js and EtherCIS and is underpinned by the internationally leading open standard for healthcare, openEHR. It also conforms to the well received paper “Defining an Open Platform” by Apperta Foundation. The exciting journey of Helm being tested by people in Leeds starts very shortly. People are at the heart of this product and they will now lead the way in its future development. Users of Helm will be able to tell us what works and what doesn’t, what would be useful, what is missing and Ripple Foundation is very excited to be a large part of this new innovation with the city of Leeds, led by Leeds City Council. The plans for Helm are for rapid expansion into the Yorkshire and Humber region. We will keep posting news on the Ripple Foundation website but do get in touch if you would like to understand more about our open platform approach for addressing some of the issues faced by Health IT. Thank you to ODI Leeds for supplying the photos taken during the session with the Health Secretary.